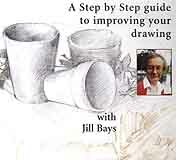 Jill explains the concepts of contour, line and tone. With a range of easy to follow exercises you will also learn how texture, negative shape and composition have dramatic effect on drawings. 60 min.